« Tiempo de Fondo Argentina reporting Karol Meyer in Bonaire! The networking event ‘De Smaak van Bonaire’ (Taste of Bonaire) was a great success. 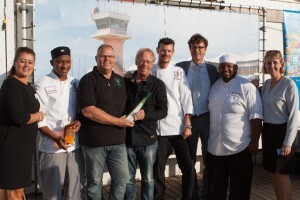 It was held on September 10 at ‘Spice Beach Club” at Scheveningen. De Smaak van Bonaire and over 75 business partners visited. This event is organized every two years by TCB and is in cooperation with BONHATA and the tourism industry. Thanks to the Bonaire Culinary Team and STINAPA, Lion Fish was on the menu; that coupled with Cadushy Bonaire Liqueur, really allowed our guests to “taste Bonaire”. The event afforded us the opportunity to strengthen our relationships with top industry people in the Netherlands. Tour operators, airlines representatives and environmental organizations were also in attendance along with several journalists. As a result, TCB and BONHATA representatives were interviewed and we are looking forward to future coverage in top trade publications such such as Travelpro and TravMagazine.